MOSCOW (Sputnik) - Russia head coach Stanislav Cherchesov said on Saturday that his squad were thinking not about awards but about representing their country during the 2018 FIFA World Cup. Russia needs to leave the result achieved at the 2018 FIFA World Cup in history and start a campaign to accomplish new goals, Russia head coach Stanislav Cherchesov said on Saturday. "Thank you very much for the reception. I thank the Ministry [of Sports] for the foundation it helped us to build… We started our campaign this year and in this house [during the reception] we are making one of the last steps [before moving on]… We need to leave our result [at the World Cup] in history and start a campaign to [achieve] new goals. It's only the beginning," Cherchesov said at the reception. On Saturday Russian Deputy Prime Minister Olga Golodets and Russian Sports Minister Pavel Kolobkov awarded the title of Honored Master of Sports of Russia to players who were included in Russia's 2018 FIFA World Cup squad and the Honored Coach of Russia title to head coach Cherchesov and his coaching staff at the Grand Kremlin Palace. "Now I understand the expression "I have no words," I didn't understand it before. I can say for sure that we were doing our job not because of the awards but for the sake of representing Russia. From the moral perspective, we managed to do it, from the sports perspective — not fully," Cherchesov said. Russia goalkeeper and captain Igor Akinfeev thanked Putin for the infrastructure created in the country for the World Cup. "We're very happy to be here. Thank you for the infrastructure that we have in our country. The World Cup was a success. This is a great event that we should be proud of, thank you," Akinfeev said. 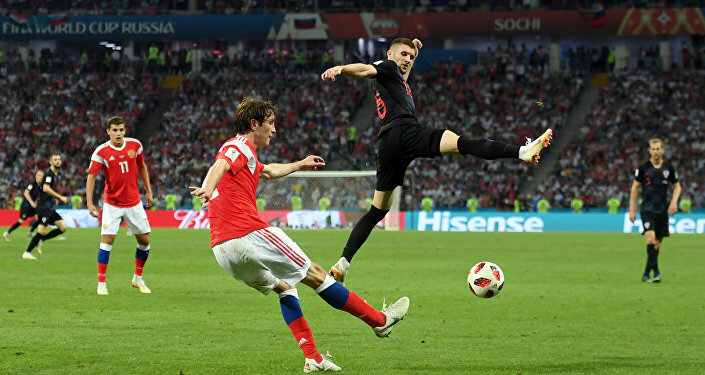 Former Russia defender Sergei Ignashevich, who announced his retirement from football shortly after the tournament, said that he and his teammates were glad to make the fans happy with their performance. "It's a great honor for us to be here. We're incredibly glad that we managed to make millions of Russians, most importantly — children, happy by just playing football," Ignashevich said. Cherchesov steered Russia to the quarter-finals of the home World Cup, which was the country’s best result at the tournament since the end of the Soviet era. Russia hosted its first-ever FIFA World Cup from June 14 to July 15, with the games played at 12 venues across 11 cities.